Dollhouse Decorating! 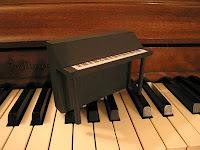 : Make your own miniature dollhouse piano! Make your own miniature dollhouse piano! * 1 block of wood 4.5" x 3.25" x .75"
* 1 thin flat wood piece 4.5" x 1.25" x .25"
Glue these wooden pieces together as shown in the picture, paint, and enjoy! Jim's Dollhouse Pages also has some tiny sheet music you can print. 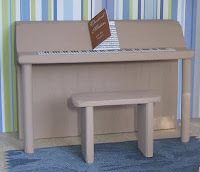 For a piano bench, take a 1" x 2.5" of thin wood and add two more pieces of wood for the legs, bringing the total bench height to approximately 1.5"
I do have an earlier post of an even simpler piano - it takes two pieces of wood. I think this one is way nicer though!